The questions are rhetorical but as the 6 o’clock deadline for protesters to remove their tents passes and news trickles in of violent demonstrations in New York, Athens and across Italy, the mood at the camp outside St Pauls Cathedral is suitably defiant. Indeed, in the early hours of Friday morning protesters occupied their third space in London, an empty office block owned by the bank UBS. The eviction notices, served by bailiffs on Wednesday on behalf of the City of London Corporation and addressed to “each and every person taking part in and/or having erected tents or other structures at St Paul’s Cathedral”, warned protesters that unless they had removed their tents by 6pm on 17 November “injunctions will be issued in the High Court.” Although legal proceedings are likely to take some time and will be complicated by the fact that the order only applies to tents on the “public highway” not to those on property owned by the church, the eviction notices are nevertheless symbolically significant. 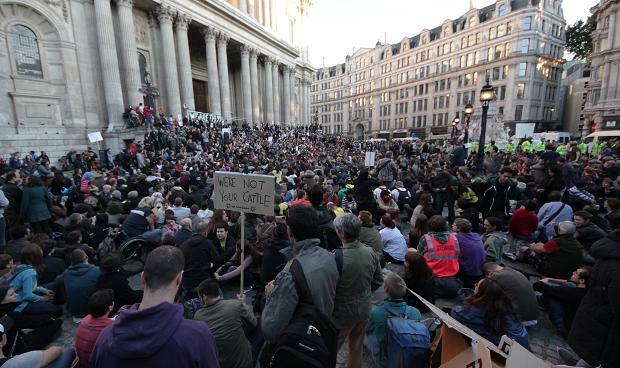 The occupation at St Pauls has achieved a huge amount in the space of a month. It has generated massive public and media interest and sparked a nation conversation not just about the nature of our economic system but also about morality and the type of society we want to live in. It has galvanised the Church of England sparking a crisis of faith among some of its members and forcing its leaders to publically reaffirm their commitment to the principles of equality and fairness. It has attracted the support of trade unions and the acknowledgement of senior British politicians including opposition leader Ed Miliband and government minister Vince Cable as well as helping to expose the City of London Corporation as the most undemocratic institution in UK local government. No surprise perhaps that it was the Corporation who served the protesters with their eviction notice. In New York it was Mayor Bloomberg who authorised the police to clear the Occupy Wall Street protesters from Zuccotti Park after nearly two months. The American occupy movement has had a massive impact tapping into a groundswell of frustration and anger and attracting widespread mainstream support. It has garnered high profile endorsements from politicians, academics and celebrities including the support of Joe Biden, Al Gore and Democratic House Minority Leader Nancy Pelosi. Earlier this month the first Occupy Wall Street advertisement began airing on TV channels including ESPN, CBS, and Fox News. And yet might the very success of the Occupy Movements have reinforced the determination of the authorities to dismantle the protest camps? On November 23rd the US Joint Select Committee on Deficit Reduction appointed to review the $1.2 trillion of cuts needed to reduce the US deficit, will present its report. If, as some financial analysts predict, they fail to come up a strategy to slash the deficit the ratings agencies might downgrade the US credit rating triggering a substantial fall in the stock market. Savage budget cuts would also be likely to have severe effects on the economy. Either way ordinary Americans are likely to suffer and there would be a knock-on effect around the globe. Were the current recession to slip into all-out depression the Occupy Movements would become a natural home for disillusioned and the dispossessed: the so-called 99 percent. When I was in Zuccotti Park last month a policeman expressed his certainty that the protesters would move on with the change of seasons. “If you’ve ever felt a New York winter” he gurned, “you’ll know what I’m talking about.” And yet despite the rain and snow and plummeting temperatures the occupation in Wall Street continued. Despite the tear gas, flash grenades and rubber bullets the occupation in Oakland continued. What will happen in London and other occupations around the world in the coming weeks and months remains to be seen. But the Occupy movement is about much more than camping in parks and the concerns that the movement is articulating are unlikely to go away anytime soon. Stefan Simanowitz spent a week with the protesters in Zuccotti Park in early October and has been visiting St Pauls since the first day of the occupation.